I recently had the pleasure of visiting the wonderful collection of new art at the newly constructed Terminal B at the Sacramento International Airport. The work epic in scale and daring in concept consists of 12 major works carefully placed for all to see. Most airports place art as an aside to a building’s design; this art exists as this buildings equal. My favorite work, and in many ways the work I consider to be the most successful of all of the pieces is Christian Moeller’s work, The Baggage Handlers. 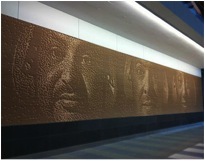 Moeller photographed headshots of some of the airport baggage handlers and with the help of computer graphics, created two huge 75’x12’ panels comprised of thin strips of wood. The 4000 pieces of wood are cut to different thicknesses, in different lengths, and placed in such a way as to have the thicker pieces cast shadows defining the faces of the baggage handlers. My next stop was Active Ecosystem, which consists of 14 LCD screens mounted across the glass surface of a 3-story elevator shaft. Artists Camille Utterback and Michelle Higa have created a series of animations controlled by the rise and fall of the elevators depicting interactive changes in different eco-systems. This work is meant to link the human movement in the airport with the outside environment. Taking the elevator, one exits on the 5th floor and heads towards the tram that takes you to the security line and the departure gates. Exiting the elevator, you traverse 3 beautiful inlaid tile floor sections. The first is A Fragment of the Universe, 18’x12’, by artist Joan Moment. The second work is Flying Colors, 12’x18’, by artist Suzanne Adan. Lastly, you pass over As the Crow Flies, 18’x30’, by artist Lynn Criswell. While these three works are very different in content and design, I found each to be visually enticing in a non-competitive surrounding. Next, you take the tram and just before you pass security you will see a glass house to your left titled, The House Will Not Pass for Any Color but Its Own, a 17’ glass house by artist Mildred Howard. Ms Howard wants us to remember that when we travel we will eventually come to our final destination- home. The house is made of thick sheets of hand blown glass that were supposed to be a warm shade of purple. Unfortunately, the glass is nearly black due to a misunderstanding between the artist and the craftsmen and as a result, I found the piece to be visually uninviting. I suppose the artist must also be disappointed with the final result. 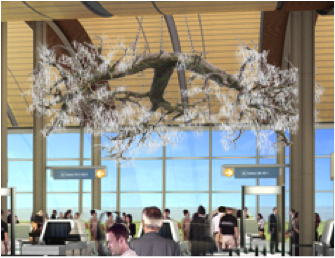 After moving through security, you are greeted by a fabulous “grand chandelier” titled Acorn Stream by artist Donald Lipinski. This massive sculpture is made to represent three oak tree trunks fused together and branching out into fully developed limbs with each branch and twig holding a hand cut polished crystal. The piece is the biggest chandelier I have ever seen, thirty feet in diameter. The chandelier serves as a location marker due to its central location on the other side of security and midway between the people movers. Moving past the chandelier we next visit a big French horn sculpture, 10 feet high, made from stainless steel, titled Your Words are Music to Their Ears by artists Po Shu Wang and Louise Bertelsen. The piece is unique in that you can send it an email and it will play you a tune. The sculpture is part wi-fi terminal and part musical instrument offering a continual parade of musical arrangments. Returning to the main terminal, we view the already famous red rabbit. Leap, by artist Lawrence Argent is a 56’ long rabbit suspended from the ceiling so as to appear as having jumped into the terminal through the ceiling while heading toward a huge granite suitcase. The artist chose red to represent speed and our inherent desire to get our stuff. While I agree with the concept, I find the rabbit to fall short in a couple of areas. I would have liked to see the rabbit trying to jump down a hole rather than toward a suitcase. The rabbit’s surface is composed of cold red triangles that are defined with black lines. These lines are a carryover from the appearance of the rabbit on the computer schematic.